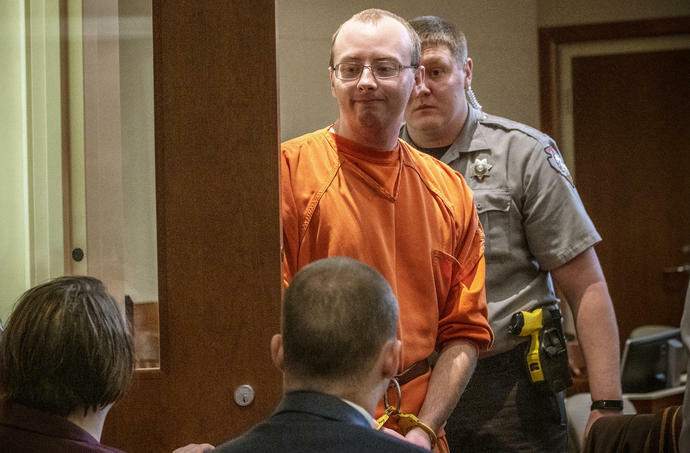 BARRON, Wis. (AP) - A Wisconsin man pleaded guilty Wednesday to kidnapping 13-year-old Jayme Closs and killing her parents, in a move that spares the girl held captive in a remote cabin for three months from the possible trauma of having to testify at his trial. In a bizarre remark as he left the courtroom, Patterson turned back and said "Bye, Jayme." His victim wasn't there. Patterson had said he would plead guilty in a letter sent this month to a Minneapolis TV station, saying he didn't want the Closs family "to worry about a trial." Patterson admitted kidnapping Jayme after killing her parents, James and Denise Closs, on Oct. 15 at the family's home near Barron, about 90 miles (145 kilometers) northeast of Minneapolis. Jayme escaped in January, after 88 days in Patterson's cabin in near the small, isolated town of Gordon, some 60 miles (97 kilometers) from her home. The plea, coupled with an earlier decision by prosecutors not to bring charges in the county where Jayme was held, increases the chances that the details of her time in captivity will remain private. Patterson stoically answered "yes" and "yeah" to repeated questions from Barron County Judge James Babler about whether he understood what he was doing. Later, as he responded "guilty," to each count, he could be heard sniffling. He paused for several seconds after the judge asked him about the kidnapping charge before stuttering, "guilty." Defense attorney Richard Jones told Babler that Patterson "wanted to enter a plea from the day we met him" and brushed off strategies presented to him, including trying to suppress his statements to investigators. "He rejected all that and has decided this is what he wants to do," Jones said. Members of the Closs family and Patterson's father and sister all left the courthouse without commenting. According to a criminal complaint , Patterson told authorities he decided Jayme "was the girl he was going to take" after he saw her getting on a school bus near her home. He told investigators he plotted carefully, including wearing all-black clothing, putting stolen license plates on his car and taking care to leave no fingerprints on his shotgun. Jayme told police that the night of the abduction, the family dog's barking awoke her, and she went to wake up her parents as a car came up the driveway. While her father went to the front door, Jayme and her mother hid in the bathroom, clutching each other in the bathtub, the shower curtain pulled shut. Patterson shot Jayme's father as he entered the house, then found Jayme and her mother. He told detectives he wrapped tape around Jayme's mouth and head, taped her hands behind her back and taped her ankles together, then shot her mother in the head. He told police he dragged Jayme outside, threw her in the trunk of his car, and took her to his cabin, the complaint said. During Jayme's time in captivity, Patterson forced her to hide under a bed when he had friends over and penned her in with tote boxes and weights, warning that if she moved, "bad things could happen to her." He also turned up the radio so visitors couldn't hear her, according to the complaint. Authorities searched for Jayme for months and collected more than 3,500 tips. On Jan. 10, Jayme escaped from the cabin while Patterson was away. She then flagged down a woman who was walking a dog and pleaded for help. Patterson was arrested minutes later. Authorities have not released any additional details about Patterson's treatment of Jayme. Soon after he was charged in Barron County, prosecutors in Douglas County - where Jayme was held - announced they had no plans to charge him for crimes there. It was a move widely seen as aimed at sparing Jayme further pain, and one that University of Wisconsin law professor Cecelia Klingele praised Wednesday. "People are always interested in hearing salacious details, but there is no 'right to know' the details of a crime victim's suffering," Klingele said in an email about Patterson's plea. Patterson grew up in the cabin where he held Jayme. He wrote in his high school yearbook of plans to join the Marines, but he was kicked out after barely a month. He worked just a single day at a turkey plant in 2016 before quitting. He told investigators he spotted Jayme while heading to work at a cheese factory where he already planned to quit after two days. The day Jayme escaped, Patterson had applied online for a job at a liquor store with a resume that misrepresented his experience. Laura Tancre, of nearby Star Prairie, said she was relieved by Patterson's plea and "happy for the little girl." Tancre, 57, worked at the same plant as Jayme's parents. "I think he should get life for killing both parents," she said. "I'd hate for him to get out and be able to do it again." Associated Press writers Todd Richmond and Amy Forliti contributed from Minneapolis. Check out AP's complete coverage of Jayme Closs' abduction and her parents' deaths. This story has been corrected to reflect that the judge's last name is Babler, instead of Gabler.